The Holy Mosque in Makkah is the most revered place of worship for Muslims around the world. At the center of the Mosque is the Ka'abah, which literally means 'cube' in Arabic. All Muslims are required to face in the direction of the Ka'abah five times every day when offering their prayers. Muslims believe that the Ka'abah, constructed of stone blocks, was originally built by Prophet Abraham and his son Ismail. Many believe it was erected on the original site of a sanctuary established by the first Prophet, Adam. Embedded in the corner of the structure is the Black Stone, a meteorite used by Abraham as a foundation stone. This stone, although respected as the only surviving object from the original building, has never been worshipped and has no special sanctity or power. The Grand Mosque surrounds the Kaaba, symbol of the oneness of God and believed by Muslims to have been built by the Prophet Abraham. The courtyard is one of the sites where the hajj, the fifth pillar of Islam, is enacted. 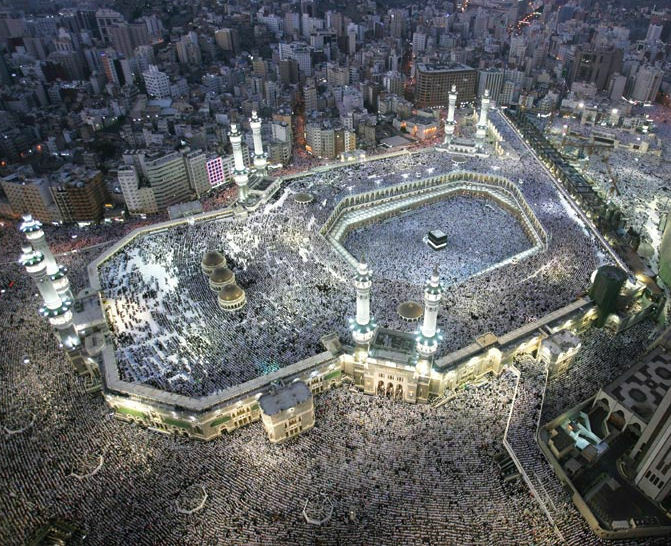 Because of the holiness of the place, no non-Muslims may enter the city of Mecca. Furthermore, all holy places come under a special injunction in Islam. Over the years, the message of Abraham was forgotten, and the Ka'abah became filled with idols, some say as many as 365 of them. People continued to make the pilgrimage, but it had become an idolatrous business enterprise for the pagan tribe of the Qu'raysh, the residents of the city of Makkah who were the traditional custodians of the Ka'abah. After the peaceful re-conquest of Makkah in the year 630 AD by Prophet Muhammad, the Ka'abah was purified of the idols in it and the pilgrimage made obligatory for all Muslims at least once in a lifetime, if feasible, and worship returned to that of Allah alone, the one and only God and Creator. At that time, the Holy Mosque consisted of an open circular plaza no larger that 2,000 square meters, located in the center of the city. Throughout Islamic history, successive Islamic regimes have spared no cost or effort to dignify and honor the Holy Mosque of Makkah. To do so was not only a matter of extreme pride, but was also viewed as the highest and most solemn of responsibilities a ruler has towards Muslim pilgrims. In the year 638, after flash floods had damaged the Holy Mosque, the Caliph Omar Bin Al-Khatab repaired the damage and enclosed the courtyard, extending the area by 500 square meters. His successor Uthman Bin Affan made a further extension in 646, estimated at 1,700 square meters. The Holy Mosque enclosure was once again enlarged in 684 by Abdullah Bin Al-Zubair, increasing the area by 3,300 square meters. In 754, 5,300 square meters were added by Abu Ja'far Al-Mansour. The successive extensions of Muhammad Al-Mahdi increased the area of the Holy Mosque by 15,000 square meters, and when the Dar Al-Nadhwa was encompassed within the Holy Mosque by Al-Mutadil Al-Abbasi, another 1,300 square meters were added. Finally, in 918 Al-Muqtadri Al-Abassi added a 950-square-meter entrance hall, increasing the area of the Holy Mosque to a total of 30,200 square meters. This size and layout was to be maintained for over one thousand years. The modern Kingdom of Saudi Arabia was established in 1932 by King Abdul Aziz Al Saud, and during his reign a new extension was contemplated. This, however, was only executed after his death, beginning in 1955 with the development of the Masa'a, the sacred track that follows the path that Haggar took between Mount Safa and Mount Marwa. It had always been set apart from the Holy Mosque, out in the open and exposed to the heat, dust and distractions of the city marketplace. The first phase of the project was to enclose the Masa'a and incorporate it into the Holy Mosque complex. In 1953 King Abdul Aziz ordered the first expansion of the Grand Mosque since the seventeenth century. A Yemeni migrant, Mohammad bin Laden, who had impressed the King with his skill and diligence, was given the contract. Work began in 1955, and most of the historic marble columns were replaced with artificial stone; three three-hundred-foot minarets and two gates were rebuilt. Ottoman architecture had come to be seen as a remnant of a colonial era, and so Abdul Aziz’s reconstruction, which expanded the mosque five-fold, was done in the Arab style of Egypt and Syria. Construction continued over the next twenty years, with surrounding districts of the old city demolished to make way for the expansion of the Holy Mosque, designed as a series of concentric octagons radiating from the existing structure. The Mata'af was cleared of some old pavilions, including the one over the well of Zam-Zam, which was relocated nearby. This meant that when the expansion was finally completed in 1976, 300,000 worshippers could complete their sacred rituals in comfort and with full concentration. This immense extension, however, was not adequate for the unforeseen numbers of worshippers now coming to Makkah with the momentous changes in the Kingdom of Saudi Arabia and in the Muslim world, and a great strain was placed on the Holy Mosque and the surrounding city. To cope with this, an ongoing program of improvements was undertaken by the government, including the replacement of the Mata'af paving with pure white marble to keep it cool to the feet under the most intense heat. As Custodian of the Two Holy Mosques, King Fahd Bin Abdul Aziz continued the policy of previous Saudi leaders to expand the facilities at the holy sites to facilitate the annual pilgrimage for a greater number of Muslims from around the world: today more than two million pilgrims take part in the annual Hajj. In 1988 he laid the foundation stone for a project designed to double the capacity of the Holy Mosque. It was completed in 1992, expanding the Holy Mosque in Makkah and its surroundings to accommodate more than one million worshippers at any one time. It is for the Ummah, the Islamic Community, that Custodian of the Two Holy Mosques made this magnificent contribution to the architectural legacy of the Holy Mosque, so that believers may worship the Lord in His House in an atmosphere of majesty and beauty. The prayer area alone was increased by 76,000 square meters, including a basement, ground, and first floors as well as a roof, and designed to accommodate an additional 170,000 worshippers. At the same time a piazza extending from Al-Masa'a was constructed, plus a continuous piazza surrounding the rest of the mosque, covering a combined area of 86,800 square meters and increasing the capacity of the Holy Mosque complex from 300,000 to 700,000 worshippers. Included in the new extension are two new 89-meter-tall minarets soaring over the new King Fahd Gate. Each is identical to the seven minarets of the existing mosque. In addition, two escalator annexes have been added as well as the extension's centerpiece, three massive domes, each 15 meters in diameter and 30 meters high. Many new technologies were developed specially for the latest expansion, and from all over the world teams of specialists, engineers, artists and craftsmen assembled to bestow on the House of Allah and its visitors the best that human ingenuity has to offer. Deep excavations were carried out to accommodate a two-level basement area extending beneath the entire extension to house auxiliary prayer space and utilities and services for the Holy Mosque. A multilevel ablution complex was built adjacent to the piazza to provide worshippers with hygienic and commodious purification facilities, including 1,440 toilets and 1091 ablution units outfitted to the highest standards with fixtures designed to withstand constant use by millions of worshippers, and 162 drinking fountains offering chilled water, transported to the Holy Mosque through an underground service tunnel 450 meters long. Another two-level ablution complex, with 690 toilets, 449 ablution units and 114 drinking fountains, is located in the underpass that connects the prayer area with the street on the eastern side. An air-conditioning system was installed to cool the new extension. The system is located in a six-story structure set some distance away and containing more than one hundred chiller units with a potential cooling capacity of nearly 38,500 tons. The cool air is pumped through insulated pipes to vents set into the interior columns, with used air sucked out through adjacent vents. The system has the capacity to pump chilled air through the network at an increased pressure in order to push out the hot air entering the Mosque through the open arcades surrounding the Mata'af. Sudden seasonal rainstorms have perennially afflicted Makkah with devastating desert floods which rush to the bottom of the valley where the Holy Mosque is located. These waters would flood the Holy Mosques and wreak havoc on the surrounding city. The installation of an extensive storm water drainage network has made these floods a thing of the past. This network was further developed during the latest extension by three new storm drainage systems, one crossing beneath the Masa'a piazza, another channeling water away from the new King Fahd Gate, and the third extending 1,175 meters through a 560-meter tunnel to the northwest of the Holy Mosque. Two months before the 2012 hajj, King Abdullah bought ten billion dollars’ worth of private property in Mecca, to expand the mosque again; its capacity will increase from around 750,000 worshippers to more than 2,000,000. The Saudi Binladin Group planned to finish the extension the by 2020. It will add a gate named for the King, and greatly increase the number of bathrooms and shaded areas for pilgrims. Men and women will carry home tales of the Grand Mosque’s splendor, the reward sought by every Muslim ruler who alters the mosque. Throughout many of the rituals of the hajj, men and women walk together, and the Grand Mosque is the only prominent mosque in the world where worshippers are not segregated.